Streetcars in the C Line's dedicated right-of-way through the Beacon Street median in Brookline in 2013. Of Boston's five remaining streetcar lines, the C Line holds the distinction of being not only the oldest line, but also the first line ever to operate in the city! Boston's first electric streetcar line, as described in Streetcar Tracks, began operations in 1887 and ran from Allston down Harvard Avenue/Street until it reached Brookline's Coolidge Corner, one of the C Line's main stops, where it turned left on Beacon Street and continued onward to Park Square downtown, the terminus of many of Boston's original streetcar lines (see "Subway" under "About the T" for more details on Park Square's streetcar operations). 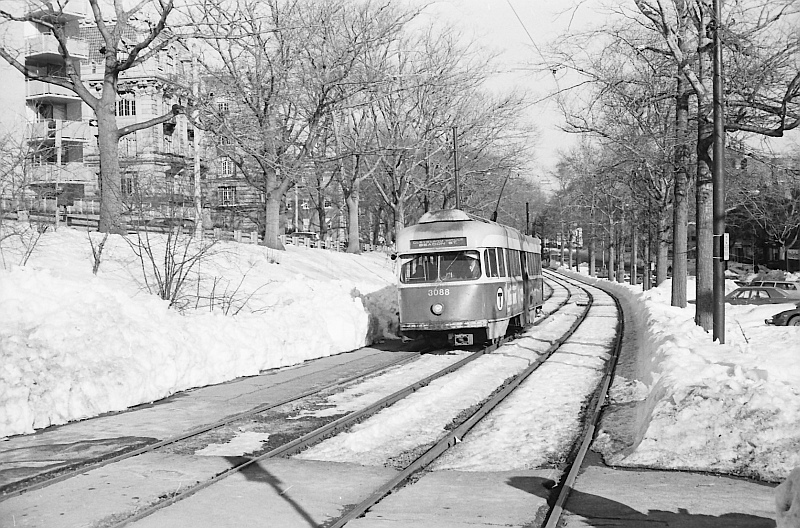 Streetcar service on Harvard Avenue/Street ended in 1938, but the portion of this original line that ran east down Beacon Street from Coolidge Corner was incorporated into what later became the C Line. As early as 1889, the predecessor to the C Line had been extended further west down Beacon Street to Cleveland Circle, and since then streetcars have continuously operated along Brookline's Beacon Street from Cleveland Circle to downtown. 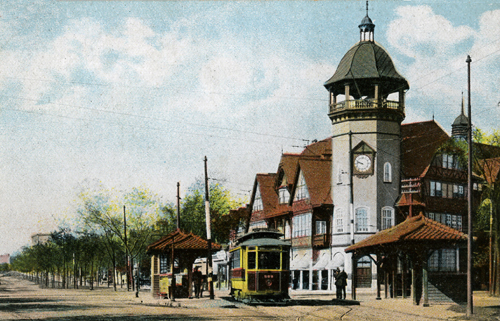 Streetcar in Coolidge Corner headed for downtown in 1913. Another unique feature of the C Line is that its reservation along Beacon Street briefly runs along the side of the road fully unimpeded by traffic crossings. A similar reservation still exists for the B Line along Commonwealth Avenue between Packard's Corner and Warren Street stations, but that reservation still has some traffic crossings along the way. Most importantly, the C Line's reservation, unlike the B Line's, is built on the side of a natural incline. PCC along Beacon Street median in the late 1970s. Image courtesy Frank Florianz. B Line PCCs along that line's former roadside reservation in 1960. The reservation has since been relocated to the center of Comm Ave. Note the hill the reservation ran along. 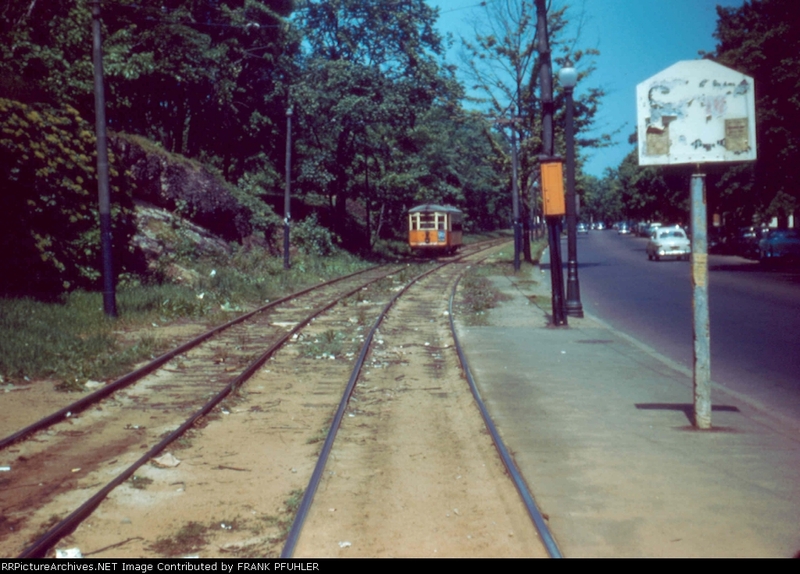 29/Mattapan-Egleston streetcar on Seaver Street in Roxbury approaching Blue Hill Avenue on its way to Mattapan in 1955. Note the rocky hill on the left. Other than the C Line's, all of these reservations were lost to road widening as cars grew in popularity and became capable of traveling at higher speeds. 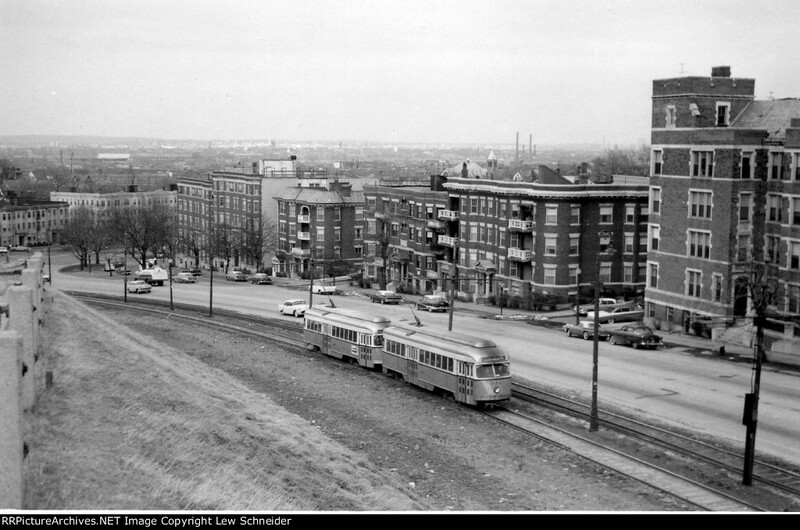 In most cases, such as with the Mattapan-Egleston Line, the loss of the reservation meant the end of streetcar service, as it was easier to run a bus along with traffic than to dedicate more space to streetcars and lose travel lanes. However, since Beacon Street has always been very wide, the C Line's right-of-way was not an obstacle to traffic flow and therefore has remained to this day. At one point, Beacon Street in Brookline had three travel lanes in each direction in some spots, which prompted the Town of Brookline to narrow the road in the mid-2000s because motorists drove too fast through town!